If you haven't yet heard of Google's Pokemon April Fools Joke, then you're probably not in need of this guide. For those of you who have heard of the the joke, which involves catching 150 using the Google Maps app, then you probably want to know where all the Pokemon are. Tokyo. They're all in Toyko. Well, there are also some in the Galapagos Islands, most major volcanoes, and then there's a lone Miltank in Columbus, Ohio. The reasoning isn't very clear on that decision. 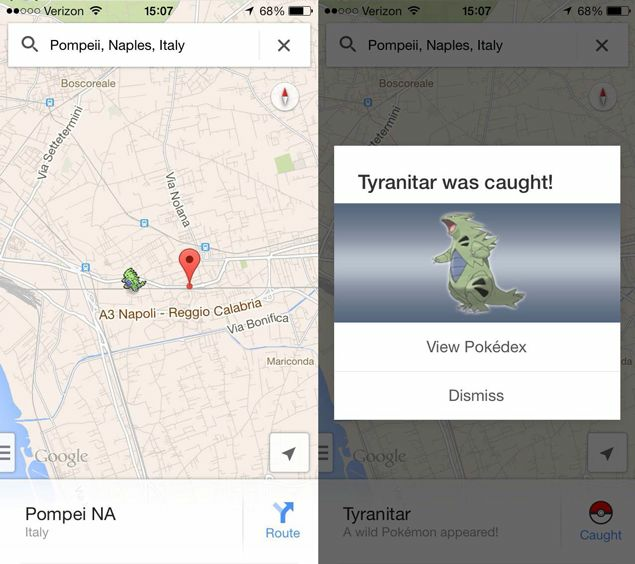 You could actually spend hours searching locations for Pokemon. Or you could follow this guide, and I'll tell you where to find them all. First things first: you probably need to know how to catch Pokemon before running around the world. This is extremely easy. Using the Google Map search bar, input a location you know Pokemon frequent and hit search. I used "Pompeii, Naples, Italy". When you see the Pokemon sprite on your map, touch it, push "catch" and the Pokemon is yours! Also, apparently Tyranitar is responsible for Pompeii. Go figure. So, before I list the rest of the locations I'd like to give a couple tips. If you're using a location from this list and you simply can't see any Pokemon near the area, zoom in. Some smaller Pokemon won't show up on the map until you zoom. Also, some Pokemon appear in multiple areas, and you might have to search more than one to find it. Dragonites appear everywhere and you will be sick of catching them by the end of the game. Plusle - PNC Pavilion, OH, USA; McMurdo Station, Antartica; CERN; Redfern Station, Sydney; Technion – Israel Institute of Technology. Salamence - Shuri Castle; 15th St & 8th Ave, NYC; southeast of Google HQ ; San Cristóbal Island, Galapagos; National Museum of Saudi Arabia (Riyadh); Chateau Frontenac, Quebec City ; Meijo Park, Nagoya, Japan, Cardiff Bay, Wales. Garchomp - St. Sava, Belgrade, Serbia; Mutianyu, Beijing, China; Charles Darwin Research Station; Ramesseum, Valley of the Kings, Egypt; Kudanzaka Hospital, Tokyo; Fukagawa Park, Tokyo; Dragon's Back, Shek O, Hong Kong. Rotom - Nintendo World, Rockefeller Center, NYC; Cable Car Museum, MIT; San Francisco; Cambridge, Mass. Audino - Ministry of Defence, Whitehall, London UK; in a mall near the Switzerland-France border; Burj Khalifa ; Kings Park and Botanic Garden, Perth, Australia; San Carlos Caltrain Station, CA; The Dubai Mall; Antelope Island in the Great Salt Lake in Utah. Inkay - Bilbao, Spain; Redwood City CA; Museum of Contemporary Art, Sydney; Lighthouse of Alexandria, Egypt. Mew - Randomized Location (may not appear until all 150 other Pokémon are caught) - Found several times at -2.98,-58.49. Rumored. Not officially confirmed - though mew does appear in google's announcement video and (allegedly) in this YouTube video Mew is believed to be one random location of a set number of locations. ''''Mew has been reported found at the following locations. -2.98,-58.49 (In the Amazon), Searching "Amazon River, Brasil", -11.42, -59.92 (where I personally found Mew), Nintendo HQ in Kyoto. Please check this thread and update with any new confirmed locations. Hooray! You've caught them all! What pimemon can you find in holland? Two days doing this, I have a lot of work, but there's no regrets!!!! Only was me missing 40 pokemon. Haha, thaaank you so much for this guide! I've spent my whole day playing this sickning game (despite the fact I was actually working, hahaha) and about half of my night completing it with your guide. Which was totally AWESOME!! !